LONDON – Feb. 15, 2017 – Northrop Grumman Corporation (NYSE: NOC) and the Royal Air Force (RAF) have successfully completed a communications interoperability trial involving both F-35B Lightning II and Typhoon FGR4 aircraft, via an Airborne Gateway developed by Northrop Grumman. The two-week trial, named Babel Fish III, funded by the Ministry of Defence (MOD), was recently conducted in airspace above the upper Mojave Desert, California, as part of the RAF’s Exercise High Rider. 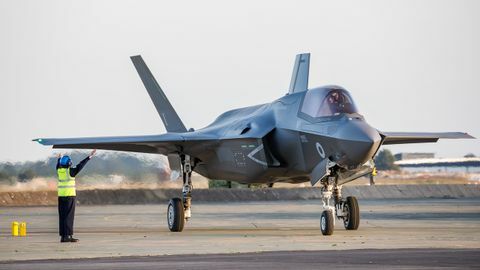 During the trial, the Northrop Grumman Airborne Gateway connected the fifth-generation F-35B, which communicates using the stealthy Multifunction Advanced Data Link (MADL), and the fourth-generation Typhoon, by translating MADL messages to Link 16 format. Link 16 is the U.S. and NATO military tactical data link used by some military aircraft, ships and ground forces to communicate and exchange tactical data. The F-35 and the Typhoon can communicate directly via Link 16 but previously could not communicate or share certain fifth-generation information. This is the first time non-U.S. fifth- and fourth-generation aircraft have shared MADL delivered data and is an important demonstration of interoperability as the UK moves closer to initial operating capability of its F-35 Lightning II Force in late 2018. Bridging this fifth-to-fourth generation platform interoperability gap was made possible by the inclusion of a Northrop Grumman Freedom 550™ software-defined radio in the Airborne Gateway. The Freedom 550™ is derived from the integrated communications, navigation and identification avionics suite the company developed and manufactures for the F-35; it was validated under the Jetpack Joint Capability Technology Demonstration programme, an effort sponsored by the Office of the Secretary of Defense and U.S. Air Force that concluded in 2014. Northrop Grumman’s Airborne Gateway translates and relays information from various sources across diverse platforms and domains to enhance interoperability, situational awareness, communications and coordination for warfighters in the air, on the ground and at sea. The system is derived from the combat-proven airborne communications node that Northrop Grumman provides to the U.S. Air Force. Northrop Grumman deployed a similar Airborne Gateway capability in March 2016 to support Australia’s Exercise Jericho Dawn 16-3, successfully demonstrating the powerful effects of integrated air and land operations during this live-fire exercise.